Ants In and Around Your Home? Call Us Today! Whether your ant problem is along the driveway, in the middle of the back yard, or in the kitchen, you need them to be gone as quickly as possible. That’s where the idea of effective ant pest control comes into the picture. By contacting the team at Responders Pest Control, the infestation will soon be over. One of the best things about using an ant control service is that you get to find out what sort of ants are on the property. This is important, since different types of ants are best eliminated using certain methods. While you can spend some time trying to figure out what sort of ant has settled into your space, leaving it to an expert is much faster and more efficient. Since choosing the right approach to ant removal involves knowing what sort of ant is involved, you want someone who can tell the subtle differences in size, body type, and color. An expert needs only one look to determine the type of ant that’s in your yard or taking over the kitchen. Many people find they are facing an invasion of carpenter ants. While all ants can cause some damage, this variety can be particularly rough on your home. That’s because a carpenter ant burrows into wood to nest. The result can be quite a bit of damage to the house frame and even some of the wood objects around the house. Many people also report that the bit from this type of ant is particularly painful. Carpenter ant control involves using the right treatment process. Our team knows how to manage carpenter ants removal quickly and without creating any messes that you have to deal with later. We also guarantee our carpenter ant treatment, allowing you to repair whatever damage the ant colony has already done and rest easy knowing the entire matter is resolved. Ants in the house of the yard can cause quite a bit of damage. Along with the breakdown of wood that carpenter ants cause, other varieties can get into your food supply. Once they find their way into food packaging, there is no possibility of salvaging any of those products. Your only recourse is to toss the packages and replace them with new ones. There are also health risks associated with ants. Some people can be bitten by red ants and experience little in the way of swelling and pain. Others will notice quite a bit of swelling and pain that is severe. People with allergic reactions to ant bites may develop swelling in the throat, develop nausea, or notice that the lungs don’t seem capable of taking in and expelling air as easily. Anyone with an allergic reaction will require medical attention immediately. The best way to kill ants is by contacting a company that has a proven track record with ant treatment. The methods used are more effective than the sprays and other products available in local stores. A professional ant exterminator also knows how to check for ants in places that you would never think to look. While you might be able to eliminate part of the problem, a professional can get rid of all the ants on your property. Whatever type of ant has invaded your property, the team at Responders Pest Control can help, Give us a call at (604) 757-1000 today or contact us using the quote request form on our website. 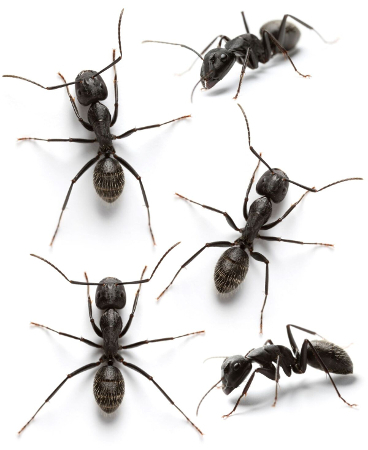 We can provide help with ant pest control in Okanagan Valley, Kamloops area, Vancouver and the Lower Mainland. Our team will also provide you with some tips that will make ant prevention a little easier.